Only a very few songs made their way in the last decades to be called THE HYMN OF A WHOLE GENERATION ! To these songs counts without a doubt MOVIESTAR , even today a non-stop played song on the radio-stations all over Europe and in the discos, a real evergreen ! 2014 Harpo is celebrating his 40th anniversary on stage !! And still going strong ! A million seller, a pop-classic song, that is one of the most played and performed song of the seventies. Every few years MOVIESTAR is re-released and shoots again in the charts, like end of the nineties in Scandinavia were the song stayed for over 40 weeks! Harpo wrote the song himself and the producer was Bengt Palmers, who was the producer of ABBA! So what almost no one knows Anni-Frid from ABBA sang the backing-vocals on MOVIESTAR. Harpo started his career in the beginning of the seventies in Sweden with the first success "Honolulu" followed by "Sayonara". In the age of 16 he went to a theatre-school. He worked as actor and wrote complete screenplays. In those years he saw his future as actor. Then all at once he took his guitar and started writing songs whenever he had time and played outside on markets and streets just for fun. In 1975 the legendary producer, publisher and owner of the RAK-label Micky Most met Harpo and took him under contract. So Harpo followed ABBA with another superhit from Sweden. 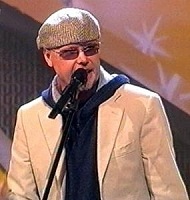 With his own composition "Moviestar" he went Top 5 in most European countries. In Germany it was one of the most sold records in 1975 and 76. 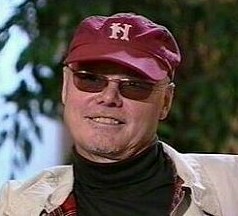 "Motorcycle Mama", "Horoscope" and "Rock`n Roll Clown" followed as Top-Ten-Hits. 1977 charted "In The Zum Zum Zummernight". End of the seventies Harpo left the music-business and went to the south of Sweden to raise horses and to start painting. 1991 Harpo was the year of his comeback with "Down At The Club" and in summer 1993 he started touring again. He really liked being on stage and so in 1995 he started to work Gerd Kehren. Since then he is touring non-stop, he has been and still is in the most successful TV-shows in Europe. On stage in places like the BERLIN WALDBÜHNE, WESTFALENHALLE DORTMUND, OPEN-AIR BAD SEGEBERG, KÖLN-ARENA, STADIUM OBERHAUSEN, SPORTHALLE HAMBURG, COLOR LINE ARENA HAMBURG, GRUGAHALLE ESSEN, OLYMPIA-HALL MÜNCHEN, HALLENSTADION ZÜRICH, CASTLE EHRENBREITSTEIN in KOBLENZ and many others. Very natural, barefoot a walking-stick with a cycle-bell in his hand, that is the way Harpo goes on stage, always and ever ! And he loves his audience and the audience loves him ! And when tenthousands start singing "Moviestar, oh Moviestar" at the end of his show, then you feel goose-pimples all over your boday ! That is HARPO ! Harpo lives with his wife Carina (married since the seventies !) very simple on a farm in the south of Sweden with lots of animals. He still is raising very successful racing-horses and counts a few international champions . Here on the silent countryside he finds his peace, power and energy for his next live-shows.